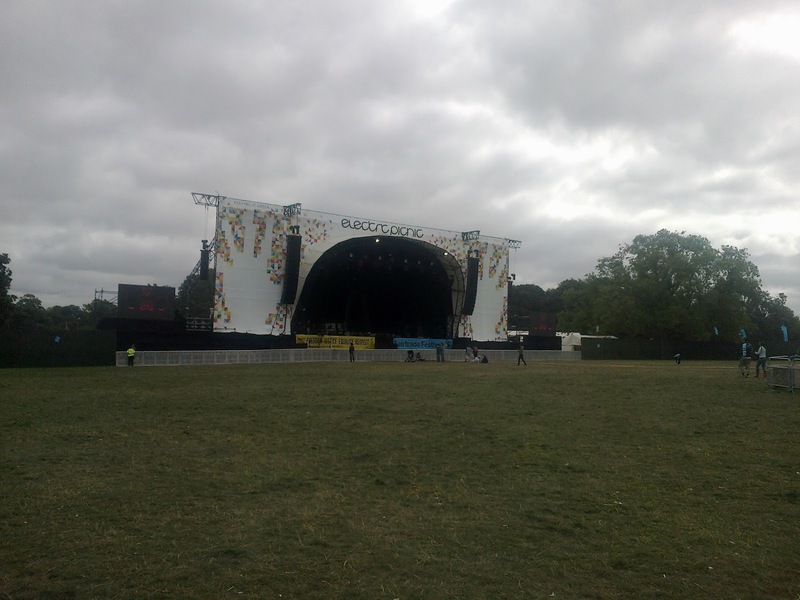 Eclectic Sound Bytes: Electric Picnic Festival Sunday 1st Of September 2013. Electric Picnic Festival Sunday 1st Of September 2013. Johnny Marr at the Electric Picnic 1/09/2013. It seemed that the most coveted admission ticket this year was for undoubtedly Ireland's greatest showcase of music and arts, the Electric Picnic festival in Stradbally County Laois. Cheaper than usual early bird tickets that came available months before were quickly snapped up and later as time went on there became an ever increasing interest. This was the 10th anniversary of the festival and perhaps that combined with an excellent line up and proper summer weather it was eventually to become a completely sold out event. Luckily I was fortunate enough to get my hands on a last minute Sunday ticket which I can now safely say became a most memorable day from start to finish. For years I had waited to see Johnny Marr as a solo performer, so too on today's bill was another hero of mine, David Byrne who would be sharing the stage with St. Vincent. That alone was enough to satisfy any interest in the day for me, but as anyone knows who has made the trip to the Electric Picnic before, there is always so much more going on. The Mindfield area which incorporates poetry, drama, debate, discussion and music was tastefully dedicated to the very recently deceased Seamus Heaney. The Comedy Stage, The Hot Press Chatroom, Body and Soul, Trenchtown and numerous merchandise and gourmet food stalls are just some of the fare to be enjoyed each year and there is so much to experience all in just one weekend. As per usual by tradition on Sunday The Dublin Gospel Choir kicked off proceedings on the main stage in the early afternoon. It was a beautiful autumnal day with a hint of sunshine peering through the clouds. The big crowds had not yet descended in from the campsites, it felt almost like the calm before the storm. At 12.30 Scottish songstress Nina Nesbitt was playing at the Electric Arena stage, her pleasant pop tunes like 'Stay Out' set the tone for a happy vibe that was to last throughout the day. This girl and her music was certainly news to me but catching some of her performance was all very worthwhile. At 4:15 the County Cavan foursome know as The Strypes took the stage, these very young lads (all still just teenagers) are certainly turning heads with their blend of vintage rhythm and blues. Music magazine NME has already heaped admiration upon The Strypes, so too has the likes of Paul Weller and Jeff Beck, that is no surprise actually when you see them perform. Complete with mop tops and early 1960's regalia, there is little doubt that behind the perhaps tongue in cheek image, there is a defining commitment to being a great band. Josh McLorey's guitar playing at times was astonishingly impressive on songs like 'Blue Collar Jane' and 'You Can't Judge A Book By The Cover', while singer Ross Farrelly who seems to constantly wear shades carried the front man position with conviction. Not to be written off as another 60's tribute band, these boys would be better described as revivalists of music from that era. Already with plenty of festival playing experience accomplished this summer including a slot at the John Peel Stage at Glastonbury, they seem to be doing everything right. Their debut album 'Snapshot' has just been released this month, this is one of the standout songs you will find on it. Johnny Marr did play at the Electric Picnic once before, a few years previously along with Modest Mouse. I did see some of that set but unfortunately due to being so far back in the crowd away from the stage it was a less that memorable experience. Today would be different as we had the more fortunate position of being right near the front as the man himself kicked off at 5.30pm. The opening song was 'The Right Thing Right' from his latest album 'The Messenger' released earlier this year to huge acclaim. I don't use the word 'legend' lightly but as any fan of The Smiths would attest to, Johnny Marr does fit the phrase without difficulty. Holding firmly to his signature Fender Jaguar guitar, Marr displayed the presence of a master of his art with this hour long set. Four Smiths songs were rolled out among the song list today 'Stop Me If You Think You've Heard This One Before', 'Bigmouth Strikes Again, 'There Is A Light That Never Goes Out' and probably the song with the most defining riff he has ever written 'How Soon Is Now'. It's hypnotic jangle hollowed around the packed arena sounding as potent now as it ever did almost 30 years ago. Let's face it, we will never see a reunion of The Smiths but this was a a more than satisfying compensation. There was also a grinding version of the Sonny Curtis song 'I Fought The Law' and 'Getting Away With It' a late '80's single taken from his collaboration project with Bernard Sumner Electronic. Finally seeing Johnny Marr perform was a monumental memory from attending this festival many times, if it ended there I would have gone home more than gratified, but there was more great music to come later in the evening. Here is an interview Marr did for RTE 2fm at The Electric Picnic. Los Angeles all girl indie rockers Warpaint were next to play on the same stage at 7 pm debuting some new material from their forthcoming second album. They had the previous day also performed at the excellent End Of The Road festival in England. Among their set list this evening was the rather excellent 'Undertow' from the 2010 release entitled 'The Fool'. I saw this band play at the Picnic back in 2011 and most memorably because it was the first act I got a glimpse of after arriving and pitching a fairly unsteady tent. The new songs were perhaps a bit too fresh to the ears to make a full judgement, however they do sound very promising. There was a call from the crowd to play this one which they thankfully obliged to, it can be found on the Exquisite Corpse EP, it's called 'Elephants'. The ever eccentric David Byrne's latest project involves an unlikely collaboration with Annie Erin Clark, aka St. Vincent, their album released last year called 'Love This Giant' was yet another turning point in his long and varied career. Just as Johnny Marr was, David Byrne had been on my list of must sees for many years and let's face it, his performances in Ireland have been few and far between. Since the days of fronting the art-rock outfit Talking Heads and later as a solo artist, Byrne has always been creating essentially interesting music. Onstage tonight, he was a dynamic presence, his craftsmanship as a performer was clearly complemented by St. Vincent and a fine array of enthusiastic brass based musicians. There was some crazy dance moves from all involved on the sometimes crowded stage making this set all the more enthralling to watch. Among the song list tonight were more than a few unexpected delights, one being 'Lazy', a song Byrne recorded with British dance duo X Press 2 more than a dozen years ago. 'Cruel' from St. Vincent's song canon was equally appreciated along with 'Cheerleader' 'Northern Lights' and 'Marrow'. There was plenty too for Talking Heads aficionados to drool over with a wonderful version of 'This Must Be The Place' with Byrne miming out an hilarious robotic dance routine. Turns were taken between songs with guitar duties from either David or Annie, both clearly enjoying the pace. This was so great, I did not want it to end, in fact it was beyond all expectations, getting better with each song, it was a live party with a torrent of beautiful noise. French horns, trumpets and saxophones provided that something extra to the songs, the perfect backing for example on 'Burning Down The House'. They were not going to get away tonight without returning for an encore, such was the rapturous demand from the sardine like packed arena. The final song choice was another Talking Heads favourite 'Road To Nowhere', ending what was undoubtedly one of the greatest performances of this festival since it began 10 years ago. David Byrne and St. Vincent. Minneapolis based band Polica played at the Cosby Stage at 10 pm, this relatively new group has the unique distinction of having no less than 2 drummers. About to release their second album next month called 'Shulamith', they have certainly been making a name for themselves Stateside with huge praise from the likes of Bon Iver and National Public Radio. Mike Noyce from Bon Iver adds guest vocals on two tracks from their album 'Give You The Ghost', released last year. "Polica makes moody music that will stick to your bones, this band is going to be huge", is what The Huffington Post said of them after they played the SXSW festival in Texas last year. Channy Leaneagh's vocals sound all the more haunting with the looping effects that run through many of their songs. Tonight at the Cosby Stage, the turn out was small due to the huge interest in the Arctic Monkeys appearing on the main stage. I didn't mind being here, it felt like the perfect chill out place to be after a very long, fulfilling day. Songs like 'Wandering Star' and 'Amongster' played out like a soothing soundtrack to an increasingly chilled air night. The discovery of new music has always been an important part of the Electric Picnic for me, Polica fulfilled that curiousity this time around. Channy Leaneagh and Chris Bierdan from Polica. Finally I did get to see 45 minutes or so of the Artic Monkey's performance on the main stage, it seemed that most revelers had descended down to this spot now for the finale of an unforgettable weekend of music. Although I appreciate their debut album which was released in 2005, the Arctic Monkeys haven't impressed me much since then. As a live act they have clearly progressed and their ambitious notions have come to fruition as the fan adoration was huge tonight. Frontman Alex Turner at one point made a comment that this was the most exciting crowd that they had played to on their whole tour. The new album 'AM' is currently number 1 in the Irish charts. The time had come to make the long trek home tonight, another Electric Picnic festival was coming to a close, welcome news was heard this week that this amazing show has been contracted to run for a further 10 years. Who knows what else is in store for this incredible show for the future, besides being the the most impressive music event Ireland or indeed Europe has on offer. I came away with only one regret this time that I didn't have a full weekend ticket. I will not be making the same mistake next year.